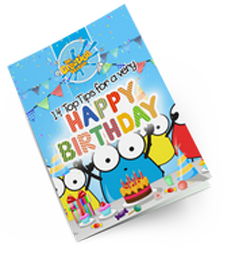 How to make your child’s birthday party totally awesome and special for them, their friends and you! Are you looking to give your child a truly awesome birthday party to celebrate the most important day of their life? Are you looking for something a bit different to the usual parties? Do you want to get away from the same old goody bags and create something truly unique and memorable? Would you love to find a party that your child, their friends and you, are going to remember and smile about together in the years to come? Hooray! You’ve come to the right place. Here at The Creation Station we are on a mission to put an end to boring parties. We are 100% passionate about providing your child and their friends with the most awesome party on the planet. We’re here to help you celebrate THE most important day in both your child’s and your life, with a totally unique arts and crafts creative party. The fun hands-on activities are tailored to create shared magical memories that your child and their friends will love. Plus, our easy no hassle approach gives you far less to do, so you can relax and enjoy the celebrations too. Every party we do is unique, because we tailor the fun creative activities around what inspires your child. If you have a theme in mind let us know and we can put our thinking hats on to create the perfect range of fun activities. If you are inviting a wide age range you will find the activities excite and delight all ages, so everyone feels included. If you are inviting girls and boys, you can rest assured that the activities will be suitable and loved by both. If you are looking for a girl or boy focused party, we can create the perfect range of activities to make the day memorable. We understand you’re busy. So, we’re here to help take the hassle away, allowing you to enjoy the most special of all days, your child’s birthday. We’ll provide the invitations and the party bags. The bags are personalised by each child. Whether your party is for 10 or 40+ choose an arty party to suit your budget. The fun packages are; Cool, Brilliant and Awesome. You can also have a one or two-hour party. We can help you plan what’s best for you. You can choose where and when you’d like your child’s party celebration. If you need a few ideas on venues, let us know and we’ll be happy to give you some ideas. How old is the birthday child going to be? If you have a promotional code pop it in here. Let the fun commence... Children’s imaginations are inspired as soon as they arrive, as they can decorate their own party bags. With a little bit of inspirational magic, the children soon discover their hidden talents and expand their creativity! It could be a wooden box, which the children transform with paints, gemstones and glitter, or a stretched canvas to create their own personal masterpiece! After this first activity, we return to the box and try out the magic again... Balls of clay may appear to be transformed into four-legged creatures, or beautiful bowls with fluffy feathers. We’re sure you get the idea! We give your child free rein to create a masterpiece. We provide all the floor and table covers, overalls and materials, so you can relax and enjoy the party! Personal, Professional, Reliable and Safe! Our Creation Station Party leaders are fully-trained, DBS checked, first aiders and insured. We use products that are safe, suitable and non-toxic. We strive to use products from sustainable or recycled sources. Our eco-friendly paints are washable and come out of most fabrics. We do suggest that any paint marks are washed off with soapy water immediately to reduce the risk of stains. We make the activities very personal to your child and the venue you choose. You can have the party at home or in a hall. What's more, we can even help you plan and set up. You can choose to have one hour or an hour and a half of exciting and inspiring fun! The children proudly return home with a unique and treasured party bag, full of mementos of a really special celebration for the day they'll never forget! Don't take our word for it! Look what people say! Since 2002, we’ve been privileged to help inspire over 650,000 children (and counting) with hands-on creative fun. We’ve won the Best Creative Play award, the Excellence and Innovation award and Best Interactive award. We’ve been featured on BBC, ITV and Sky and most importantly our customers have rated our parties Five-Star on Trustpilot. Remind me about this later! Want us to remind you about this event later? Fill in the details below and we will send you an email on your chosen date.